@MCPO S117, personally I can't stand when people use emojis in memes... especially when it's "WHO DID THIS 😂😂"
@MCPO S117, we can see that the dude is already laughing; why add the yellow things? @MCPO S117, I'd bet this was made by one of the news networks directly. Their social media director is trying their hardest to be hip and cool. To be fair, Bernie's plans were a bit naive too. He probably would have had just as mu ch if not more trouble getting his ideas passed. Not condoning what Trump does, but it is probably more of a problem of bureaucratic red tape than the specific policy. @FriendlyWalrus, I would say Bernie's plans were a little more than "naive". Granted what trump is talking about right now is essentially Obamacare light and will probably end up just a shįt. @FriendlyWalrus, the point is everyone except Trump apparently knew it was complicated and would be hard. 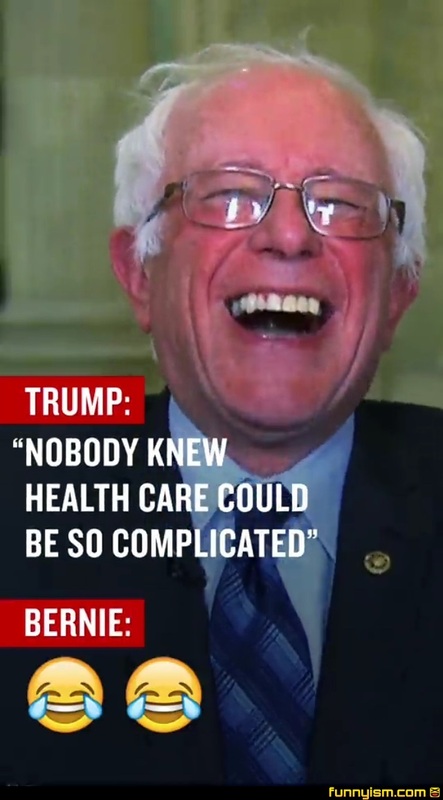 I'm not saying Sanders would have gotten what he wanted passed but he knew it would take a lot of effort and be incredibly difficult, Trump seems to have thought he could just wave a magic wand which is idiotic. @FriendlyWalrus, i dont think his plan was too naive. A single payer system would have helped a lot in getting costs down (more negotiating power). The only reason this is being opposed so much is because it will take away a lot of money from insurance companies. A lot of other 1st world countries do it, this is an area where we lack and do not lead the world. We may have the best doctors around but if u cant afford them why have them? @FriendlyWalrus, difference is he had a plan. Trumps plan was: make a better health system. @Implicit88, i think one of the problems with saying "everyone else is doing it" is the fact that sometimes everyone else is wrong. @Trademark Toast, Dont be one of those. When that whole topic hit the fan he had less in his first 12 days than Obama did. @Implicit88, because people who can afford the best doctor? Ever wonder why the british are poked fun at for their teeth? Free healthcare that isnt as good because its free. @FriendlyWalrus, Bernie just doesn't know economics, much less does he know the economics of healthcare. @Implicit88, lol. Because the VA is the epitome of single payer efficiency. The government has never made anything "cost less". They take a dollar from you as tax, keep 35% give 35% to their cronies and use maybe 30% to the actual program the tax was intended to pay for. @Snarfel Burger, i never said lets do it because everyone else is. I gave a reason for my logic and gave additional proof that other countries are doing it as proof its possible. If you can give evidence or a theory as to why i might be wrong it would be appreciated. @Caine, lol i think thats a stereotype but i never said it needs to be the same. We can build a better system if we collaborate instead of fight and compromise. A lot of the costs of healthcare has to do with the insurance vs healthcare provider contracts and paperwork. We need to completely revamp the system. Trumps plan is merely of making a way to give the rich tax breaks while giving poor people less. When you look at the numbers thats all it means. Oh and instead of the govt penalizing you the insurers can now. Yay!! @Implicit88, oh my fûcking god! The horror! A business making a profit, and employing people and supporting thousands of families...! What a fûcking travesty. You're right. It would be better if everyone depended on a benevolent government to support us all. And your comment about how it's just for rich Trump supporters show that you have 0 understanding of what the bill entails. But keep up the partisanship! It's going great! @Half Black Man, "but, they don't have enough money either..." "I said put it over there!!!!" Bernie's laughing because he's thinking, "dude its so simple, you just tax the 1% they'll never run out of money!" @4Chan Ambassador , it'd have only added $17 trillion to the US debt to go with Bernie's healthcare policies. I mean, that's totally sustainable, right?